On February 5th we reported the discreet launch of the Amels Limited Edition 199 motor yacht and now the yard tells us that she's been christened Event. Designed by Tim Heywood, the 60.6m superyacht (hull 5501) is characterised by her scimitar bow. It gives a longer waterline to the yacht, similar to one of a conventional 65m motor yacht, and it reduces the fuel consumption. A top speed of 16.5 knots and a range of 5,000 nautical miles at 13 knots are expected. The interior, designed by Laura Sessa, accommodates 12 guests in six cabins: the full-beam master suite is on the main deck, two VIPs are on the bridge deck, and a double and two twins are on the lower deck. Tim Heywood comments: 'I’m so pleased that Amels and the owner of Event shared my passion for such a thrilling looking design as the Amels 199. On paper and in concept form the scimitar bow and reverse tumblehome features of the design looked very exciting, and now to see the reality is a dream come true.. 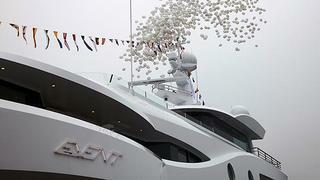 Event is offered for charter by Imperial Yachts. She will be available in Norway in May and June before heading to the West Mediterranean.